The 2019 Cotton Bowl will be hosted at AT&T Stadium in Arlington, TX, just minutes from Downtown Dallas. Choose from Cotton Bowl travel packages, game tickets, transportation to the Cotton Bowl game, and VIP fan options including tailgate parties and pep rallies. Stay in the heart of Arlington, close to the stadium and take in the game experience with fellow College Football fans! Purchase a Cotton Bowl ticket package and stay near AT&T Stadium in Arlington, TX. Cotton Bowl Ticket Packages include hotel accommodations in Arlington near Cowboys Stadium, tickets to the Cotton Bowl, and more! 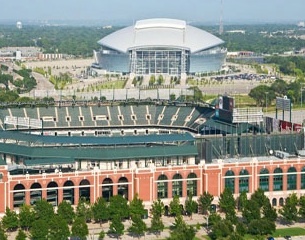 The home of Dallas Cowboys, AT&T Stadium in Arlington, TX, is also the home of the Cotton Bowl Classic. The Cotton Bowl had been home to the Cotton Bowl Classic from 1937 until 2010. However, the game was then moved to AT&T Stadium. Seems fitting that the Dallas Cowboys and the Cotton Bowl would continue a long relationship. The Cowboys once played all of their home games in the Cotton Bowl from 1960 to 1971. Now the Cowboys return the favor and host the annual Cotton Bowl game. The Cotton Bowl will host the college football semi-finals for the 2018-19 season, and the best way to experience this matchup is with a Cotton Bowl travel package with Sports Traveler! The Cotton Bowl game has always been considered one of the premiere bowl games in college football. Now the game is played in one of the premiere stadiums in the world. AT&T Stadium is a spectacle all by itself. There is not a better stadium to host the Cotton Bowl and so many other major events. Other notable events hosted out of AT&T Stadium include the Advocare Classic, 2014 Men's Final Four, and Super Bowl XLV. This modern marvel of architecture can seat around 100,000 people and features one of the largest LED screens in the world. The stadium cost an estimated $1.3 billion dollars to construct and was opened on May 27, 2009. The price of the stadium can be seen in its VIP amenities which include 342 executive suites, an extenisve artwork collection, and retractable roof.